(CNN) -- The 2008 Atlantic hurricane season ended Sunday, marking the finish of one of the busiest and costliest hurricane seasons ever. 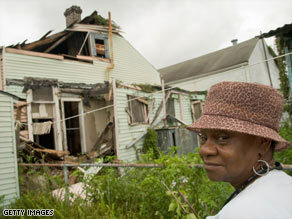 Irma Watson stands next to a dwelling damaged by Gustav in New Orleans, Louisiana, in September. The damage caused by this year's Atlantic hurricanes is estimated at $54 billion, according to the National Climatic Data Center. That's second in recorded history only to 2005, the year Hurricanes Katrina and Rita devastated the Gulf Coast. The total that year was an estimated $128 billion. Government studies have noted that, when adjusted for inflation and other factors such as population density in coastal areas, some hurricane seasons from early last century could be seen as more expensive. Still, the huge financial impact of this year's storms took their toll on an already-struggling economy. It was the fourth busiest Atlantic hurricane year since 1944. The National Climatic Data Center said 2008 is "the only year on record in which a major hurricane existed in every month from July through November in the north Atlantic." The most destructive was Hurricane Ike. Its unstoppable force wiped out neighborhoods in parts of Texas. Even a week later, remnants of its impact were still being felt in the Great Lakes region. Texas had earlier taken a beating from Hurricane Dolly, which battered South Padre Island with 100 mph winds, making it the worst storm to hit the island in more than three decades. Hurricane Gustav was also responsible for much of the 2008 devastation, leaving crippled communities, businesses, and homes from Haiti to Louisiana. Hurricane Hanna, not long after, brought massive floods to Haiti, killing hundreds and leaving thousands helpless, homeless, and hungry, before churning its way toward North and South Carolina.